We would like to start this week’s communication with the following reminders. There are only three days remaining for the Creative Economic Development month. Within these three days, you can still to design and post your cards; take pictures (photos), make a video or short film and post them to support poverty relief and sustainable development works. Our activities related to innovation and ideas conversion into projects are still on progress. It is pointless to argue that to fight poverty and enhance sustainable development, we need to keep creating and innovating. We even need more these activities at this time than at any other ones as market-based are in transition. Our Sedecim fundraising campaign ends today. For those who have not been able to donate, give a gift or leave a legacy; we would like to remind everybody we will accept their support whenever they decide to do it. Thank you! As of today until the end of this week, we are thanking all our supporters (current and past ones). We would like to take this opportunity to thank them/you for helping CENFACS IN ENHANCING AND SUSTAINING FREEDOMS AND CAPABILITIES BY WORKING IN ALLIANCE WITH LOCAL PEOPLE TO DEVELOP SUSTAINABLE INITIATIVES. For more information about these thanksgiving days, read below. Also, this week is the kick-off of our Summer Programme, particularly the humanitarian relief appeal of this programme. We are re-appealing to you/our supporters to support poor children, young people and families (CYPFs) in Africa over this Summer. Most of poor CYPFs there do not have any means to have a Summer of Relief because of poverty. They get bound in their remote land and community without any hope. They have never known any other ways of life except distress, hardship, desperation, vulnerability, helplessness and hopelessness. CENFACS would be grateful to you if you could bring some relief to them over this Summer. This week is finally the continuation of World Anti-poverty System (WAS) campaign as we informed you at the beginning of Spring. CENFACS has called for e-Mobilisation Days between 27 June and 2 July 2018 under the WAS campaign to engage users, supporters and the entire development community to develop momentum regarding the proposals for an International System for Poverty Reduction. The mantra for this year’s e-mobilisation call and days is Coalesce to Shape the Pattern of Global and African Poverty Relief. Further details about these call and days are given below. These are Special Days we would like to dedicate in thanking all those who contributed to our work for any types of support they have given us over this financial year. This dedication is normally held in the last week of and by the end of June.For this year, they are held from 27 June to the end of June 2018. 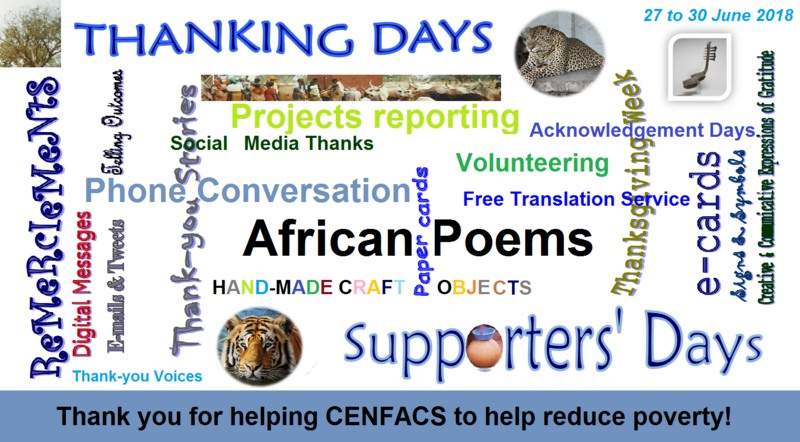 If you are one of the CENFACS’ supporters, please we would like to let you know the Thanking Days at CENFACS are your Days. Do not hesitate to get in touch, if you do not mistakenly hear from us, we will welcome your human touch, reconnect with you and thank you on the occasion for the helpful difference you made to our work and project beneficiaries. Your invaluable support has meant a lot for our programme and project beneficiaries over this financial year. We would like to express all our sincere gratitude to you for helping us to help reduce poverty. For further details, contact CENFACS’ Thanksgiving End of June 2018 Team. World Anti-Poverty System (WAS) campaign has returned this June 2018 with our call to action to Coalesce to Shape the Pattern of Global and African Poverty Relief. The Coalescence call starts on 27 June 2017 and will continue throughout July 2017. It will remain alive in whatever we will undertake as global advocacy activities during the month of July 2017 and beyond. Before dealing with the Coalescence call, let us recap on the last call, which was: Step up and Drive Relief forward (SDR). The aim of SDR was/is to support, defend and make the international development community understand the need of an internationally agreed system for poverty reduction that is fair for all, especially but not exclusively for people and communities with severe and or critical level of poverty. After making the development case for WAS, SDR is an engaging content and process to winning the minds and hearts of all development supporters for the formation of an internationally agreed system to reduce and end poverty. It is the continuation of the CENFACS’ Argument following the Post-2015 Global Development Agenda and discussions that led to the setting up of the United Nations 2030 Agenda and Sustainable Development Goals. The CENFACS’ Argument was then the international development community should be a bit more ambitious by going beyond and establish an internationally agreed system to reduce and end poverty. So, the Summer 2017 slogan for the WAS campaign was: STEP UP AND DRIVE RELIEF FORWARD. The case for WAS is still demanding in today’s reality of the world. In the light of what is happening now with the increase in trade tariffs together with the eminent risk of trade war, one can wonder whether or not the current international system, if it exists, is suitable for the poor. This is let alone the on-going global migration flows crisis. This Summer 2018, our mantra is COALESCE TO SHAPE THE PATTERN OF GLOBAL AND AFRICAN POVERTY RELIEF. After stepping up and driving forward relief from June 2017 to now, we are now going to take a further challenge in coalescing to shape the pattern of global and African poverty relief. This is where we stand with our WAS campaign. From making the case for WAS to winning the minds and hearts of prospective supporters, SDR has been a step up and forward in building an understanding on the need for an internationally agreed system for poverty reduction. Now that some supporters have understood or sympathised with the idea of such a system, there is another need which is to come together as one body to mould in a particular pattern or form the kind of poverty relief we all want in order to develop a collective system against it. If one shares the idea of WAS, then what they can do to coalesce to shape the pattern of global and African poverty relief is to come together with us as one community and mould in a particular pattern or form the kind of poverty relief we all want. We can come together as one local, national and global community of WAS. We can come together as one WAS digital and non-digital community. The above are the defining and engaging lines of our call to action for WAS. To advocate or campaign or even join WAS, please contact CENFACS NOW! For further details about WAS and or to support, contact CENFACS.